Some sources of uncertainty can be reasonably represented by probabilities, whereas others are more difficult to characterise probabilistically. The natural randomness in the climate system can be characterised by frequentist (or objective) probabilities, which describe the relative frequency (sometimes referred to as 'likelihood') of a repeatable event under known circumstances. There are, however, limitations to the frequentist description, given that the climate system is non-stationary at a range of scales and that past forcing factors cannot be perfectly known. The reliability of knowledge about uncertain aspects of the world (such as the 'true' value of climate sensitivity) cannot be empirically represented by frequentist probabilities alone. It is possible to construct probability distributions of climate sensitivity that look like frequency representations, but they will always have substantial elements of subjectivity embedded (Morgan and Keith, 1995; Allen et al., 2001). The inherent need for probabilistic analyses in a risk-management framework becomes problematic when some analysts object in principle to even assessing probabilities in situations of considerable lack of data or other key ingredients for probabilistic assessment. To help bridge this philosophical conflict, it has been suggested that making subjective elements transparent is an essential obligation of assessments using such an approach (e.g., Moss and Schneider, 2000). One method of characterising uncertainty due to a lack of scientific knowledge is by Bayesian (or subjective) probabilities, which refer to the degree of belief of experts in a particular statement, considering the available data. Another approach involves non-probabilistic representations such as imprecise probabilities (e.g., Hall et al., 2006). Whether probabilities can be applied to describe future social choice, in particular uncertainties in future greenhouse gas emissions, has also been the subject of considerable scientific debate (e.g., Allen et al., 2001; Grubler and Nakicenovic, 2001; Lempert and Schlesinger, 2001; Pittock et al., 2001; Reilly et al., 2001; Schneider, 2001, 2002). Value diversity (such as different attitudes towards risk or equity) cannot be meaningfully addressed through an objective probabilistic description. It is often assessed through sensitivity analysis or scenario analysis, in which different value systems are explicitly represented and their associated impacts contrasted. The probabilistic analyses of DAI reported in this section draw substantially on (subjective) Bayesian probabilities to describe key uncertainties in the climate system, such as climate sensitivity, the rate of oceanic heat uptake, current radiative forcing, and indirect aerosol forcing. SeeWGI Chapter 9 (Hegerl et al., 2007) and Chapter 10 (Meehl et al., 2007) for a more detailed discussion. While these uncertainties prevent the establishment of a high-confidence, one-to-one linkage between atmospheric greenhouse gas concentrations and global mean temperature increase, probabilistic analyses can assign a subjective probability of exceeding certain temperature thresholds for given emissions scenarios or concentration targets (e.g., Meinshausen, 2005; Harvey, 2007). Table 19.2. Methods to identify climate policies to avoid key vulnerabilities or DAI. Analyse the implications for temperature increase of specific concentration stabilisation levels, concentration pathways, emissions scenarios, or other policy scenarios. Derive ranges of emissions that are compatible with predefined constraints on temperature increase, intolerable climate impacts, and/or unacceptable mitigation costs. Include representations of key vulnerabilities or DAI in a cost-optimising integrated assessment framework. Identify cost-minimising emissions pathways that are consistent with predefined constraints for GHG concentrations, climate change or climate impacts. others include additional gases and aerosols in their analysis, often representing concentrations in terms of CO2-equivalent ppm or radiative forcing in W/m2 (see Forster et al., 2007 Section 2.3). Dynamic analyses include information about the trajectories of GHG emissions and development pathways, GHG concentrations, climate change and associated impacts. Related static analyses examine the relationship between stabilisation targets for GHG concentrations and equilibrium values for climate parameters (typically the increase in global mean temperature). Note that the term 'GHG stabilisation' is used here with a time horizon of up to several centuries. Over a longer time period without anthropogenic GHG emissions, CO2 concentrations may return to values close to pre-industrial levels through natural processes (Brovkin et al., 2002; Putilov, 2003; Semenov, 2004a,b; Izrael and Semenov, 2005, 2006). O'Neill and Oppenheimer, 2004; Wigley, 2004; Izrael and Semenov, 2005; Kheshgi et al., 2005; Meinshausen et al., 2005; Frame et al., 2006). Overshoot scenarios are necessary for the exploration of stabilisation levels close to or below current concentration levels. Some studies treat the uncertainty in future GHG emissions and climate change by analysing a discrete range of scenarios. O'Neill and Oppenheimer (2002) examined ranges of global mean temperature increase in 2100 associated with 450,550 and 650 ppm CO2 concentration stabilisation profiles, as reported in the TAR (Cubasch et al., 2001). They concluded that none of these scenarios would prevent widespread coral-reef bleaching in 2100 (assumed to have a threshold 1°C increase above current levels), and that only the 450 ppm CO2 stabilisation profile is likely to be associated with avoiding both deglaciation of West Antarctica (assumed to have a threshold of 2°C above current levels) and collapse of the MOC (assumed to have a threshold of 3°C increase within 100 years). Lowe et al. (2006) consider a suite of climate scenarios based on a 'perturbed parameter ensemble' of Hadley Centre climate models, finding that, for stabilisation close to 450 ppm, 5% of their scenarios exceed a threshold for deglaciation of West Antarctica (assumed to be 2.1°C local warming above 1990-2000 levels). Corfee-Morlot and Höhne (2003) review the current knowledge about climate impacts for each 'reason for concern' at different levels of global mean temperature change and CO2 stabilisation, based on published probability density functions (PDFs) of climate sensitivity, finding that any CO2 stabilisation target above 450 ppm is associated with a significant probability of triggering a large-scale climatic event. 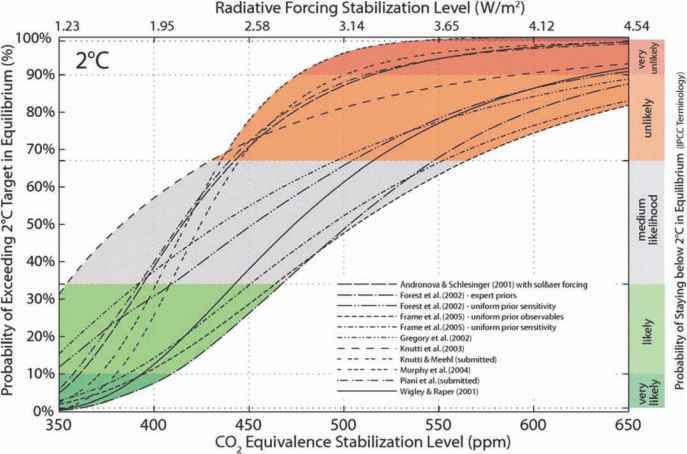 An inverse analysis of the implications of reaching CO2 stabilisation at 450 ppm concludes that more than half of the SRES emissions scenarios leave this stabilisation target virtually out of reach as of 2020. A robust finding across such studies is that the probability of exceeding thresholds for specific key vulnerabilities or DAI increases with higher stabilisation levels for GHG concentrations. Other studies quantify uncertainty using probability distributions for one or more parameters of the coupled social-natural system. Figure 19.1, for instance, depicts the likelihood of exceeding an equilibrium temperature threshold of 2°C above pre-industrial levels based on a range of published probability distributions for climate sensitivity. To render eventual exceedence of this exemplary threshold 'unlikely' (<33% chance), the CO2-equivalent stabilisation level must be below 410 ppm for the majority of considered climate sensitivity uncertainty distributions (range between 350 and 470 ppm). Key caveat: The analysis in Figure 19.1 employs a number of probability distributions taken from the literature. The WGI AR4 has assessed the body of literature pertaining to climate sensitivity, and concludes that the climate sensitivity is 'likely' to lie in the range 2-4.5°C, and is 'very likely' to be above 1.5°C (Meehl et al., 2007 Executive Summary). For fundamental physical reasons, as well as data limitations, values substantially higher than 4.5°C still cannot be excluded, although agreement with observations and proxy data is generally worse for those high values than for values in the 2-4.5°C range (Meehl et al., 2007 Executive Summary). 'Likely' in IPCC usage has been defined as a 66 to 90% chance, and 'very likely' has been defined as a 90 to 99% chance. Therefore, implicit in the information given by WGI is a 10 to 34% chance that climate sensitivity is outside the 'likely' range, with equal probability (5 to 17%) that it is below 2°C or above 4.5°C. Furthermore, the WGI assessment assigns a 90 to 99% chance that the climate sensitivity is above 1.5°C. However, the shape of the distribution to the right of 4.5°C - crucial for risk-management analyses - is, as noted by WGI, so uncertain given the lack of scientific knowledge, that any quantitative conclusion reached based on probability functions beyond 4.5°C climate sensitivity would be very low confidence. For these reasons, we assign no more than low confidence to any of the distributions or results presented in this section, particularly if the result depends on the tails of the probabilty distribution for climate sensitivity. Nevertheless, as noted here, a risk-management framework requires input of (even if low-probability, low-confidence) outlier information. Therefore, we present the literature based on probabilistic analyses to demonstrate the framework inherent in the risk management approach to assessing key vulnerabilities. CO2 concentrations is 536 ppm, and there is a 17% chance that the stabilisation level necessary to avoid DAI is below current atmospheric CO2 levels. A similar analysis by Harvey (2006, 2007) added the explicit normative choice of an 'acceptable' probability (10%) for exceeding the probabilistic temperature threshold for DAI. With similar assumptions about the probability distributions for climate sensitivity and the DAI temperature threshold, he finds that the allowable CO2 stabilisation concentration is between 390 and 435 ppm, depending on assumptions about aerosol forcing. Of course, these results are quite sensitive to all the assumptions made, as both authors explicitly acknowledge. Figure 19.1. Probability (see 'Key caveat' above on low confidence for specific quantitatitive results) of exceeding an equilibrium global warming of 2°C above pre-industrial (1.4°C above 1990 levels), for a range of CO2-equivalent stabilisation levels. 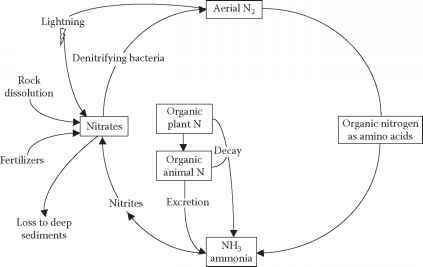 Source: Hare and Meinshausen (2005). permanent exceedence of thresholds for key vulnerabilities or DAI (e.g, Hammitt and Shlyakhter, 1999; Harvey, 2004; O'Neill and Oppenheimer, 2004; Hare and Meinshausen, 2005; Knutti et al., 2005). With this in mind, Schneider and Mastrandrea (2005) suggested two metrics - maximum exceedence amplitude and degree years - for characterising the maximum and cumulative magnitude of overshoot of a temperature threshold for DAI, as shown for an illustrative scenario in Figure 19.2 (bottom panel). Since the rate of temperature rise is important to adaptive capacity (see Section 19.4.1) and thus impacts, the time delay between now and the date of occurrence of the maximum temperature (year of MEA on Figure 19.2b) is also relevant to the likelihood of creating key vulnerabilities or exceeding specified DAI thresholds.